To craft a pair of solid wood internal doors for a former Chapel converted into a private residence. The doors were constructed using European Redwood Pine, and took inspiration from the traditional shaping of chapel windows and doors from this location. Custom beading: A bespoke plywood pattern was created for the glazing bead profile. 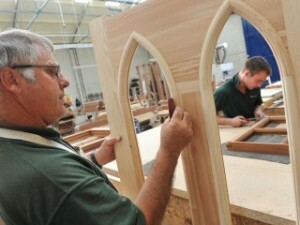 Our highly skilled joiners then machined around the pattern, before carefully finishing each door by hand. Doors were supplied unglazed, and the client arranged glazing himself on-site.